On a Saturday afternoon I decided to go catch Life of Pi. 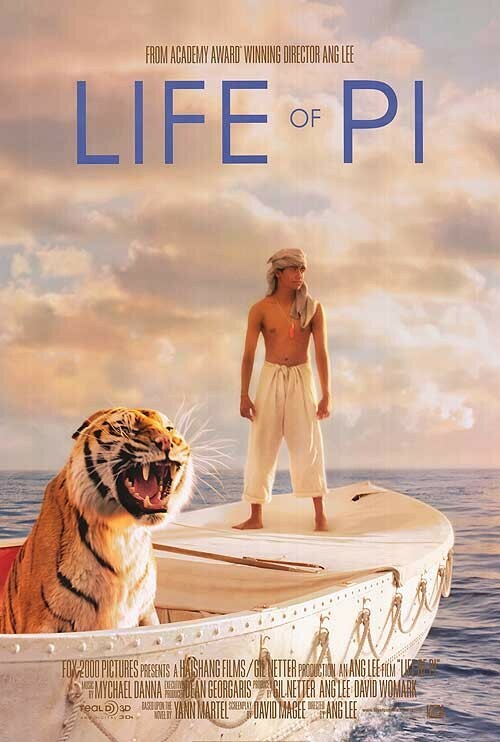 I had not read the book prior to seeing this movie so I wasn’t sure what to expect…well…besides that somehow…a boy gets stuck on a life boat with a Bengal tiger…and I’m sure there wasn’t a happy reason for that…I was right. This movie isn’t exactly happy go lucky. It has funny moments to break the tension, but there are some parts that are really sad (and sad to watch). I really liked the film though. The story is being narrated by the boy as an adult (so ***SPOILER ALERT** clearly he survives)…but I didn’t expect the moral of the story in the end…and I don’t want to ruin it but I think it was an interesting message. Definitely made me think. I know (from reading about the film) that a lot of times the tiger was animated with CGI but I thought it was really outstanding. It was harder than I’ve ever experienced to tell when he was animated and when he was real. I think the effects of the movie were nice and there were some really beautiful scenes. I thought this was a good film and worth seeing. But don’t expect it to be happy go lucky…there are some hard moments to watch in this film. I don’t think this will win Best Picture but deserves recognition. It gets 4 stars from me. I went with a friend to check out Zero Dark Thirty the next day and all I had to say was…wow. I thought this film was really good. I was nervous (with it being almost 3 hours) that this film would lose my attention or maybe even be too violent for me. But I thought it did a great job telling a really interesting story. Were there hard to watch moments? Yes. Were there some moments where I lost track of a few names? Sure (but that usually happens to me). Were there some tense/startling moments? Absolutely. But honestly it wasn’t nearly as full of all of those things as I expected. I was actually fascinated in the story that was being told, especially with the lead that ultimately lead to finding and capturing Osama Bin Ladin. Jessica Chastain (nominated for best actress) was good but I don’t suspect she will win. And while I think the movie was great…I’m not sure it will wind up with best picture. But I highly recommend seeing this movie! 5 stars! I went into Silver Linings Playbook knowing that some people thought it was the best movie they had seen all year, and some people were a bit disappointed with it. But those who were disappointed I think didn’t realize that this “romantic comedy” wasn’t exactly a comedy. I mean…there are funny moments…but really you are watching a man (and family) learning to live with bipolar disorder and his quest to find (and work for) the silver lining in his life. He has a plan…which is a little diverted when he meets Tiffany who has her own issues but is willing to help him reconnect with his wife. Honestly, going in knowing that this movie isn’t just total romcom really made me look for the other messages. I think I connected with this movie more than I expected to and I really enjoyed it. I think it deserves the recognition that it is getting (as do all the actors…it is nominated for all 4 acting categories). I think Jennifer Lawrence and Robert DiNero have the best chances of winning their categories for this film. Their performances were particularly great. Actually Bradley Cooper is really good as well…but I think other actors are more likely to win this year. I like the film and I enjoyed the story. I would recommend it…(not expecting a full blown romantic comedy!) It gets 4 stars from me! 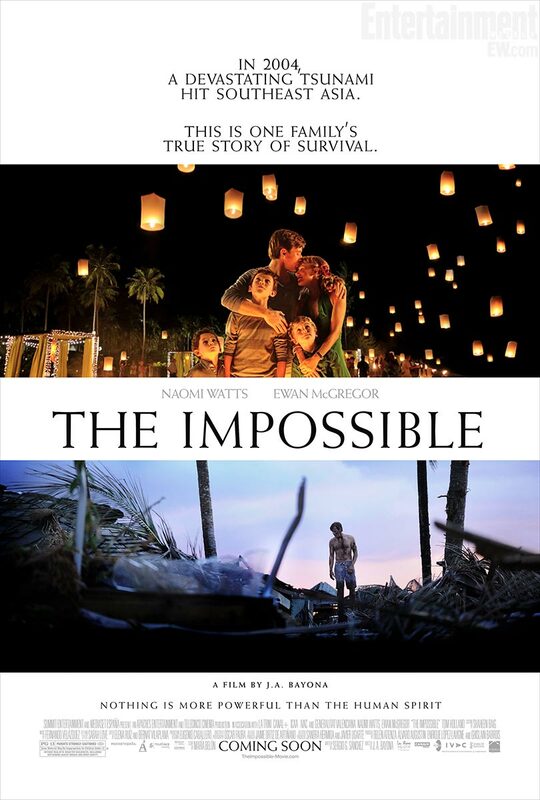 I caught a showing of The Impossible last weekend…and it was really really good. The movie tells the incredible true story of a family of 5 who was caught in the horrible tsunami of December 2004 and how they managed to find each other. The movie did an amazing job of really portraying how truly terrifying and devastating of an event this was. Obviously there were parts of this film that were hard to watch…but I really just found it moving overall. Naomi Watts was fabulous as was Ewan McGregor. The kids were really good as well. The oldest boy has the largest role…but the other boys did a great job as well. I really thought this was a wonderful movie. Naomi Watts deserves her nomination and really possibly the win here. (But I’m not sure she can pass Jennifer Lawrence’s momentum)…I thought this was a great movie. I want to give this one 4 and a half stars (but I don’t have a half star icon! )…so I’ll stick with 4…but know it is a HIGH 4! Looper managed to land on EW’s list but didn’t get any nominations this year. But to continue with the original mission to watch the movies on the list…I kept this one high on the Netflix queue. If you are unfamiliar, Looper is about a mob assassin who kills people the mob of the future sends back in time to him. Eventually he is assigned to “close his loop” by killing his future self…but his future self has other plans. 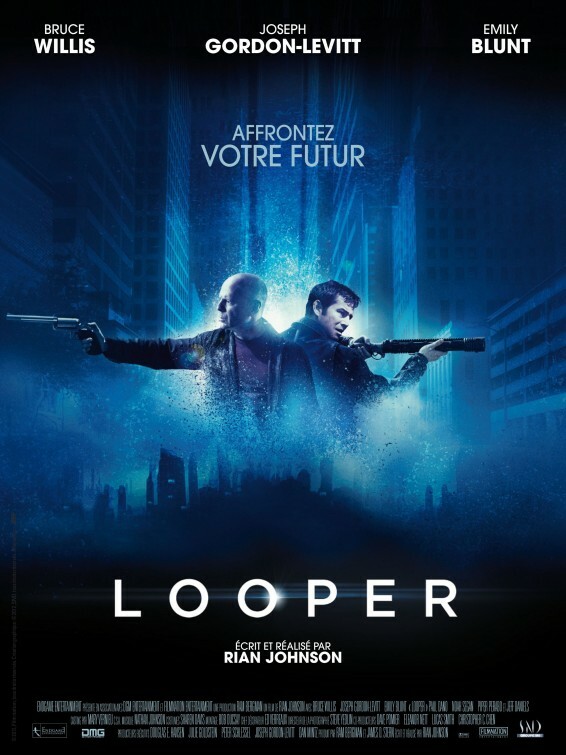 I don’t tend to like shoot-em-up action movies but I found Looper interesting. I liked the sci-fi concept and thought they did well sticking within the rules of the world they set up. I don’t want to spoil it so I will just say I also thought the ending/resolution really worked for the film. I actually think it really could have been a contender for original screen play. Joseph Gordon-Levitt was made to look like a young Bruce Willis and I thought the make up work was really cool. I like Joseph Gordon-Levitt a lot and it was weird he both looked like himself but so different at the same time. Maybe it could have been a contender for makeup as well. I won’t be making any predictions for it during the Oscars…but I enjoyed the film…3 stars! That’s all I have for now! Don’t forget you can keep track of my Mission Oscar Snob progress between posts by clicking on the page link along the top of the blog! Have you seen any of these films? What did you think? Let me know in the comments!